Looking for a tasty make-ahead breakfast idea? You’re going to love these low FODMAP orange scones. Made with gluten-free flour and fresh orange zest, these scones are a stress-free way to start your busy day. These low FODMAP orange scones are magical. Their texture is so light and airy, no one will believe they’re low FODMAP. 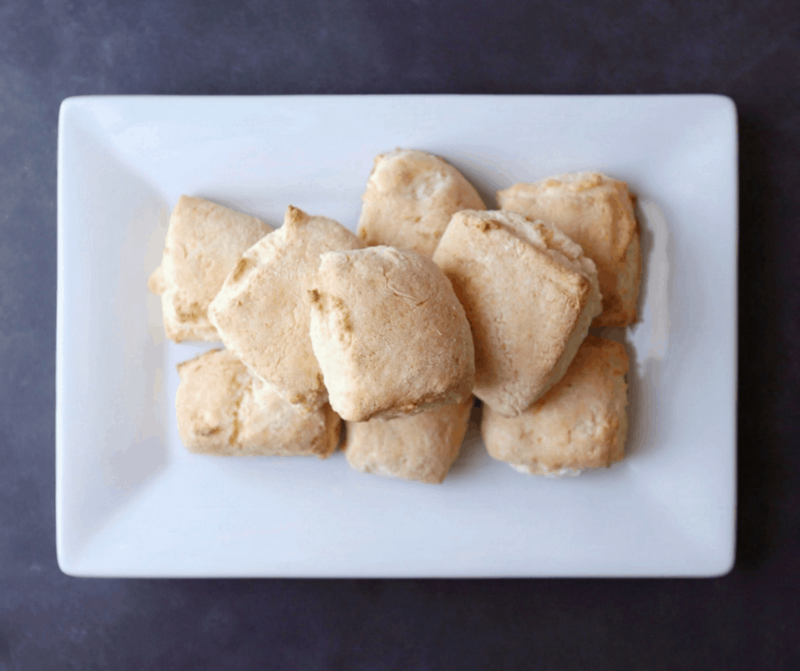 The trick to these tasty scones is cold butter and mixing the dough as little as possible. To keep your butter cold, grate it directly into the flour mixture. Stir the pieces until they’re lightly coated with flour then leave them alone! The trick to kneading the dough is to do it as few times as possible. You want to mix air into the dough, but you don’t want to make it tough. This can be challenging when you’re using gluten-free flour, so I try not to knead the dough more than six times. Think these low FODMAP orange scones sound great, but you don’t have time to try them now? Don’t worry. You can PIN THIS POST for later. These low FODMAP orange scones will make breakfast a breeze. Check out the notes below for tips on keeping this recipe FODMAP friendly. First up is flour. If you’re in the elimination phase, you’ll need to use gluten-free flour. For my Canadian peeps, I use PC’s gluten-free flour. I like it because it doesn’t have any gums and it works in everything from pancakes, to cupcakes, to pastry. If you’re in the elimination phase, you’ll also need to use a lactose-free milk. The fat content of the milk isn’t important in this recipe, so use whatever you have on hand. Finally, this recipe also uses butter. Even though this is technically a dairy product, according to Monash University, butter doesn’t have any FODMAPs (because it’s all fat). This means you won’t need to use a lactose-free product. I normally eat these low FODMAP orange scones for breakfast, but they also make a great afternoon snack. If you’re looking for something to pair with your scone, I highly recommend this low FODMAP London fog. It has a rich, silky flavour that works really well with the sweet, delicate flavour of the scones. If scones are your jam, you might also want to try these low FODMAP savoury cheddar and bacon scuffins or these sweet strawberry scuffins. 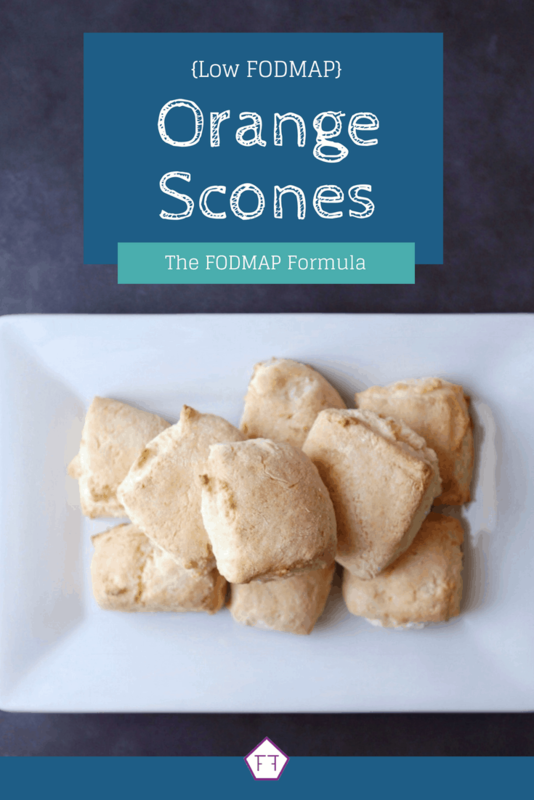 Want to try these low FODMAP orange scones? Don’t forget to PIN THIS RECIPE for later! Looking for an easy make-ahead breakfast? Try these low FODMAP orange scones. With a light, fluffy texture and a hint of citrus, these scones are a stress-free way to start your day. Preheat oven to 375 degrees and grease a baking sheet. Set aside. Combine flour, sugar, baking powder, and salt in a large mixing bowl. Add the grated butter and stir it around until the pieces are lightly coated with the flour mixture. Make a well in the center and set aside. Combine the egg, milk, and orange zest in a small bowl. Then, add it to the center of the well. Stir the wet and dry ingredients gently until they form a ball of dough. Turn the dough out onto a lightly floured surface and knead it six times. Then shape it into a 6" square about 2" thick. Sprinkle the top with the remaining sugar and cut into 9 squares. Place each square on the prepared baking sheet and bake for 15-18 minutes (until the edges are golden brown). Store in an airtight container. 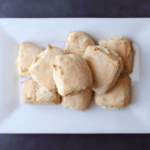 These low FODMAP scones are a tasty way to start your day. If you like this recipe, sign up for my mailing list below. You’ll get new low FODMAP recipes and articles delivered right to your inbox. Want more FODMAP friendly breakfast ideas? Follow me on Pinterest for even more inspiration. Together we’ll get the Low FODMAP Diet down to a science!